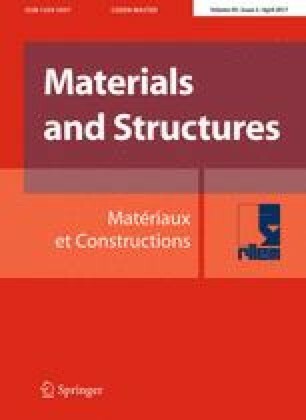 At present several methods are available to predict the durability of reinforced concrete structures. In most cases, one dominant deterioration process such as carbonation or chloride penetration is taken into consideration. Experimental results as well as observations in practice show that this is not a realistic and certainly not a conservative approach. In order to test more realistically, RILEM TC 246-TDC, founded in 2011, has developed a method to determine the durability of concrete exposed to the combined action of chloride penetration and mechanical load. In this report, a test method is presented which allows determination of realistic diffusion coefficients for chloride ions in concrete under compressive or tensile stress. Comparative test results from five different laboratories showed that the combination of mechanical and environmental loads may be much more severe than a single environmental load without mechanical loading. Modelling and probabilistic analysis also showed that the obvious synergetic effects cannot be neglected in realistic service life prediction. This final report was reviewed and approved by all members of the RILEM TC 246-TDC. TC Membership: TC Chairlady—Yan Yao, China; TC Secretary—Ling Wang, China. Members: Folker H.Wittmann, Germany; Nele De Belie, Belgium; Erik Schlangen, The Netherlands; Christoph Gehlen, Germany; Hugo Eguez Alava, Ecuador; Max Setzer, Germany; Carmen Andrade, Spain; Rui Miguel Ferreira, Finland; Erika Elaine Holt, Finland; Gideon Van Zijl, South Africa; Feng Xing, China; Tiejun Zhao, China; Michal A. Glinicki, Poland; Xiaomei Wan, China; R. G .Pillai, India; Klaas Van Breugel, The Netherlands. Zhendi Wang, Yin Cao, Balqis Md Yunus and Juan Li are Ph.D. students who have contributed substantially to the TC. The financial support from the following four organizations is gratefully acknowledged: (1) National Natural Science Foundation of China (Grant No. 51320105016), (2) the Ecuadorian National Secretary for Science and Technology “SENESCYT”, (3) ESPOL University (Ecuador) and Magnel Laboratory for Concrete Research of Ghent University (Belgium), (4) Ministry of Higher Education Malaysia (MOHE) and Universiti Teknologi MARA (UiTM).